Fact: The X-Wing books were the best Star Wars books. Double fact: The Rogue Squadron comics from Dark Horse were awesome. Unassailable triple fact: Poe Dameron is the best. Bearing all this in mind, we’re just a touch excited about Marvel’s upcoming Poe Dameron comic, which seems to be a spiritual successor to the Rogue Squadron tales. The ongoing comic is coming from writer Charles Soule and artist Phil Noto, who gave us a few extra details during an interview with Comic Book Resources. Covering Poe’s career as part of the Resistance’s crack squadron of soldiers (both in the skies and on the ground) before The Force Awakens, the series will take place in a period where the conflict between the First Order, the New Republic, and the fledgling Resistance is more of a cold war than a hot one. This means Poe and his comrades will be fighting a wide array of foes beyond the First Order as they go out on missions. I think of it like a bunch of different genre movies, stacked up one after the other. I’ve been doing this for a while, actually—Lando was a heist movie, and Obi-Wan & Anakin is a post-apocalyptic steampunk western. Poe will be the same, with each arc feeling a bit different. The first story is straight-up weird, ‘70s sci-fi, but there’s plenty more to come—a prison story, an espionage tale—lots of great stuff. The name’s Dameron, Poe Dameron? Poe Dameron: Prison Break? I’m shoving my wallet against my computer screen, and yet a copy of Poe Dameron #1 is not in my hands. 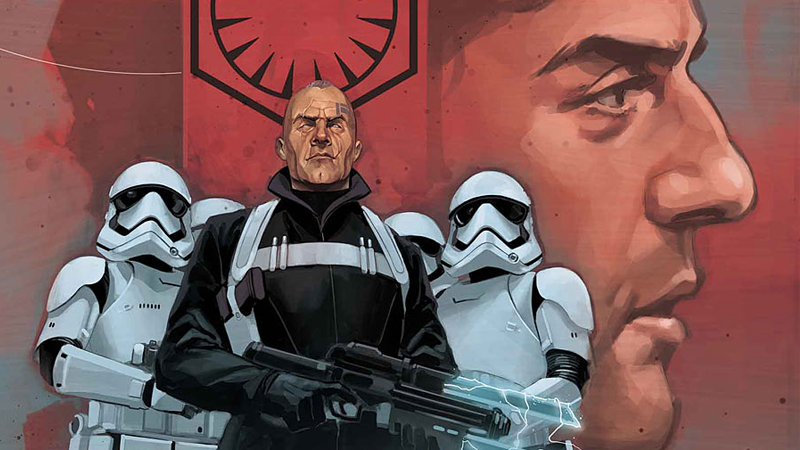 The main villain is a new character, an intelligence officer in the First Order with some ties to the old Empire. He’s a scary guy, a little older, which I think gives him a cool gravitas in much the same way Peter Cushing delivered as Grand Moff Tarkin in A New Hope. His approach to conflicts is very interesting, and he can be a charmer. I think of him almost like an evil Lando. This series sounds like it could be out-rogue-ing Rogue One even before we see a snippet of footage from that movie, and it sounds completely fantastic. Anyone who’s ever loved the men and women sitting in the cockpits of an X-Wing should be very excited about this Poe Dameron #1, which hits comic book store shelves April 6th.